The oleander aphid, Aphis nerii Boyer de Fonscolombe, sometimes called the milkweed aphid, is a common pest of several important ornamental plants in the families Apocynaceae and Asclepiadaceae. 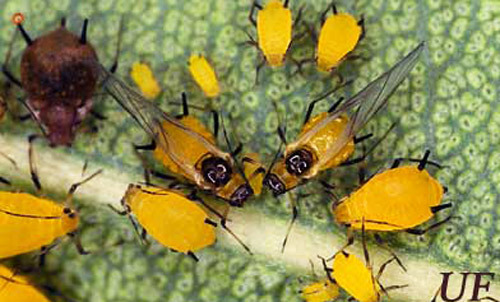 This bright yellow aphid with black appendages is commonly found in Florida feeding on oleander, Nerium oleander, milkweeds, such as butterfly weed, Asclepias tuberosa, and scarlet milkweed, Asclepias curassavica, and wax plant, Hoya carnosa. The oleander aphid is cosmopolitan, being found in tropical to warm temperate regions throughout the world. This species probably originated in the Mediterranean region, the origin of its principal host plant, oleander. It is thought that the oleander aphid is an obligate parthenogenetic species; thus the adult aphids are all female and males do not occur in the wild. Adult females may be winged or wingless. The winged adult females (alata) are yellow and black with dark wing veins while the wingless forms (apterae) are yellow with black cornicles, antennae, legs, and cauda (tip of abdomen). Nymphs are similar to apterae in appearance except that they are smaller. Size ranges from 1.5 to 2.6 mm in length. Figure 1. Alata and nymphs of oleander aphid, Aphis nerii Boyer de Fonscolombe, on oleander leaf. Photograph by J. Castner, University of Florida. Females are viviparous and parthenogenetic, meaning that they deposit nymphs rather than eggs and that the progeny are clones of the adult female (i.e., sexual reproduction is not necessary for offspring production) The nymphs feed gregariously on the plant terminal in a colony that can become quite large. Nymphs progress through five nymphal instars. As in all Sternorrhyncha, there is no pupal stage and adults are produced from the final nymphal instar. Normally apterous adults are produced but alate adults occur under conditions of overcrowding and when plants are senescing, allowing the aphidsto migrate to new host plants. The parthenogenetic mode of reproduction, high fecundity, and short generation time allow large colonies of oleander aphids to build quickly on infested plants. Figure 2. Large colony of oleander aphids, Aphis nerii Boyer de Fonscolombe, on plant terminal growth. Photograph by J. Castner, University of Florida. 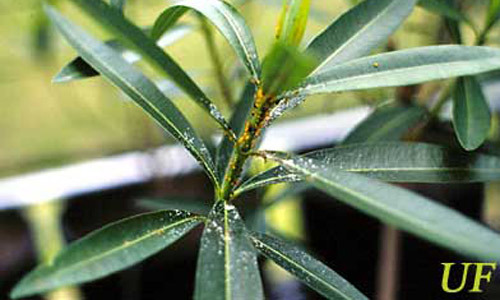 The host range of the oleander aphid includes several genera of Asclepiadaceae (Gomphocarpus, Asclepias, and Calotropis) and Apocynaceae (Nerium and Vinca). 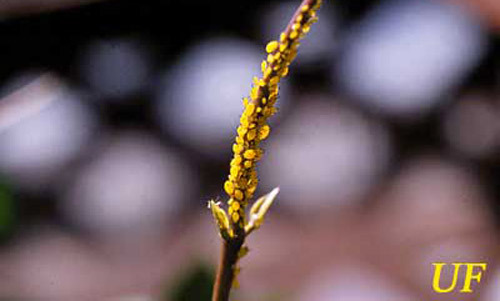 It can occasionally be found infesting plants in the families Compositae, Convolvulaceae, and Euphorbiaceae. In addition, it has been found on citrus. This aphid is able to transmit several viruses including sugarcane mosaic potyvirus and papaya ringspot potyvirus. However, in Florida, the main concern with oleander aphid is the large and unsightly colonies produced on oleander and milkweeds. 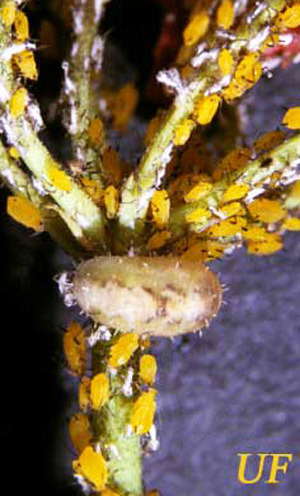 The oleander aphid ingests sap from the phloem of its host plant. 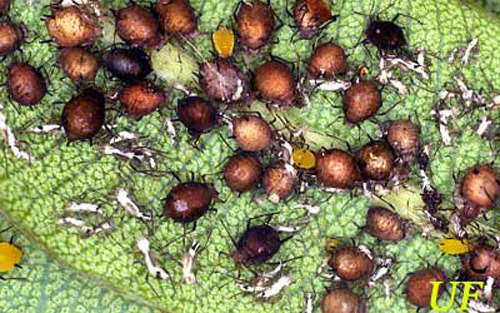 The damage caused by aphid colonies is mainly aesthetic due to the large amounts of sticky honeydew produced by the colony members and the resulting black sooty mold that grows on the honeydew. In addition, the growing terminals can be deformed. Of more concern to nursery managers is the potential for stunted plant growth due to repeated heavy infestation throughout the year. Figure 3. Inflorescence of scarlet milkweed heavily infested with oleander aphids, Aphis nerii Boyer de Fonscolombe. Photograph by Lyle Buss, University of Florida. Figure 4. Terminal growth of oleander heavily infested with oleander aphids, Aphis nerii Boyer de Fonscolombe. Photograph by Heather McAuslane, University of Florida. Cultural controls offer the best means of managing oleander aphid infestation on oleander. Reduced levels of watering, pruning, and fertilization will reduce the production of tender shoots, the favorite food of oleander aphid. 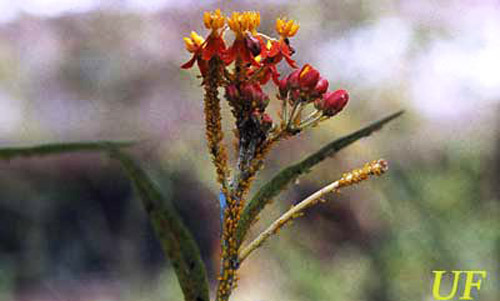 On smaller apocynaceous plants grown as nectar sources for butterflies or as larval host plants for monarch butterflies, the infested shoot can be pruned out and discarded or aphids can be dislodged with a strong stream of water. Natural biological control can be quite effective in controlling populations of the oleander aphid (Hall and Ehler 1980). The most common species of parasitoid attacking the oleander aphid is the wasp, Lysiphlebus testaceipes (Cresson) (Hymenoptera: Aphidiinae). 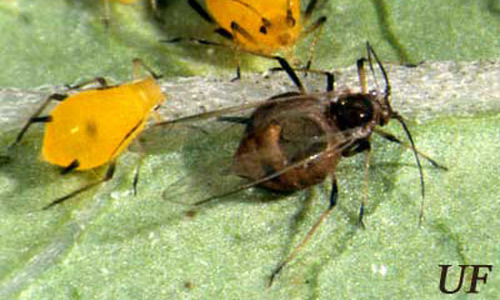 The female parasitoid lays eggs in the aphid nymphs. 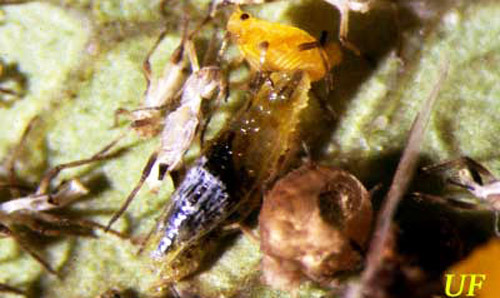 The parasitized aphid develops into a papery, light brown, swollen mummy and the parasitoid develops within this mummy. A single parasitoid emerges from the mummy when the aphid's body has been consumed. In addition, generalist insect predators such as syrphid larvae; lacewings in the families Chamaemyiidae, Chrysopidae, and Hemerobiidae; and coccinellid larvae have been observed feeding on aphid colonies. Figure 5. Winged adult oleander aphid, Aphis nerii Boyer de Fonscolombe, with hole through which the parasitoid, Lysiphlebus testaceipes (Cresson), emerged. Photograph by Lyle Buss, University of Florida. Figure 6. Colony of oleander aphid, Aphis nerii Boyer de Fonscolombe, that has suffered heavy parasitism by Lysiphlebus testaceipes (Cresson). Photograph by J. Castner, University of Florida. Figure 7. Syrphid fly larva feeding on nymph of oleander aphid, Aphis nerii Boyer de Fonscolombe. Photograph by J. Castner, University of Florida. Figure 8. Syrphid pupa on scarlet milkweed inflorescence infested with oleander aphid, Aphis nerii Boyer de Fonscolombe. Photograph by Lyle Buss, University of Florida. Oleander aphids sequester cardiac glycosides, recognized heart poisons, from their host plants (Rothschild et al. 1970). They also fortify their cornicle secretions with these bitter, poisonous chemicals. Their bright aposematic (warning) coloration and possession of toxins protects them from predation by certain species of birds and spiders (Malcolm 1986). Spiders that have the cornicle secretion applied to their mouthparts immediately retreat and attempt to clean them. These cardiac glycosides appear not to harm the parasitoids and generalist insect predators associated with oleander aphid. Insecticidal soaps and oils are often effective against soft-bodied insects such as aphids. Other insecticides are not necessary in the home garden environment given the high level of natural biological control, ease of killing aphids with insecticidal soaps and oils, and incompatibility of use on butterfly nectar or larval host plants. Blackman RL, Eastop VF. 2000. Aphids on the World's Crops: an Identification and Information Guide. Wiley, New York. Essig EO. 1958. Insects and Mites of Western North America. MacMillan Publishers, New York. Hall RW, Ehler LE. 1980. Population ecology of Aphis nerii on oleander. Environmental Entomology 9: 338-344. Malcolm SB. 1986. Aposematism in a soft-bodied insect: a case for kin selection. Behavioral Ecology and Sociobiology 18: 387-393. Rothschild M, von Euw J, Reichstein T. 1970. Cardiac glycosides in the oleander aphid, Aphis nerii. Journal of Insect Physiology 16: 1141-1145. Shelton, A. Lysiphlebus testaceipes, (Hymenoptera: Aphidiinae). Biological Control: A Guide to Natural Enemies in North America. (9 May 2017). Publication Date: November 2001. Reviewed: April 2014. Latest revision: May 2017.